It was a beautiful early spring day when I left on my latest trip. Tampa Bay was shimmering in the sun. My first flight was short, a climb up to 25,000 feet and down again in Miami. But from there to Nairobi, Kenya, it would take two 8.5 hour flights, with a stopover in London. I was excited as it’d been just over 10 years since I last visited Kenya. It would be a work trip of course, with a heavy meeting schedule, but I would be in the wildlife capital of the world! I was hoping for a small break to go for a short game drive in the Nairobi National Park. The first morning when I woke up to sunrise over the city, I felt I was back in Africa. I watched some big birds circling in the skies and spotted a Bateleur, an eagle-like raptor, in the distance. He was scanning the cityscape for breakfast. Much in the same way Papa Osprey scans the bay here at home. And so the days went, I was hurrying from one meeting venue to another. Working. Walking 2-3 miles during each working day. And seeing much vibrant beauty on the way in this green city. Snapping iPhone photos from the car window, whenever natural or manmade sights that caught my eye. After long days I would come back to my hotel to eat, work some more and to rest. The locals were jokingly calling it the “Obama Hotel”. The President had stayed there during his recent visit. Not in the cheapest single room, but in the presidential suite. It is a fresh hotel with wonderful gardens and great security. I had to walk down to the gates and snap a picture of its beautiful entrance garden. The back garden didn’t disappoint either. It was a tranquil oasis for a late afternoon tea or a pre-dinner drink. On Valentine’s Day the staff spread some cheer to us who had to spend the day away from our loved ones. I received a nice vase of miniature roses. That was a wonderful gesture, much appreciated, and those roses lasted for the duration of my trip. And I got my break last Wednesday. A free afternoon! Every minute of it, until sunset, was spent on a four hour game drive in the National Park that is only a short 40-minute drive from the city center. This 117 sq km (45 sq miles) park has a dry climate at an altitude ranging from 1,533 metres (5,030 ft) to 1,760 metres (5,774 ft). It houses a diverse range of habitats and a wide variety of wildlife, including over 400 species of birds. Yay! And yes, everything seems to be fine at the salt marsh. Mama Osprey is incubating now. Papa is shuttling fish for her, and taking turns sitting on the egg(s) so she can get a break. But more on that as soon as I have an opportunity to go out and greet my feathered friends. Have a great week everyone, I will try my best to catch up on your blogs in the next few days. The other day when I was reading a post of a great blogger, Anka, I thought of my favorite actress, Meryl Streep, whom I first really noticed in the celebrated 1985 film based on Karen Blixen’s most famous book “Out of Africa”, written under the pen name of Isak Dinesen. This Sydney Pollack film won 7 Academy Awards, including Best Picture. Although almost 30 years old, the film still feels timeless to me. If you haven’t seen it, here’s a link to the trailer http://www.youtube.com/watch?v=CHowfGGR3l8. I hope it will entice you to watch it – even if you were not yet born when it first came out. Both the book and the film start with Blixen telling us “I had a farm in Africa, at the foot of the Ngong Hills”. The story is multi-faceted and all-round intriguing, spanning the period from 1914 to 1931 when the author lived on her coffee estate close to Nairobi in Kenya. But I will always remember the film, and watch it again, for its beautiful capture of Africa’s natural beauty and the time-typical environments. 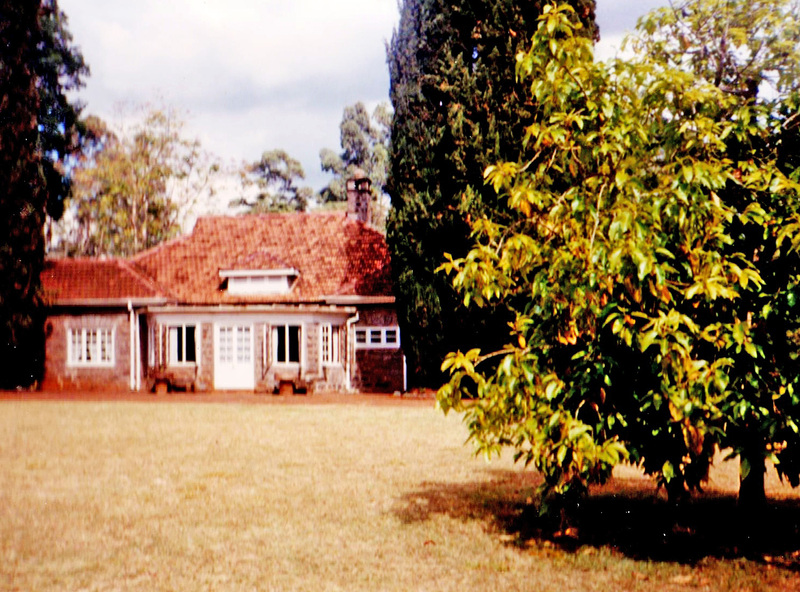 When Karen Blixen and her then husband Baron von Blixen Fincke moved from Denmark to Africa in 1914, they first lived in a farm-house called Mbagathi. In 1917, they bought a nearby farm-house, which became her long-time home she affectionately called Mbogani, meaning “the house in the woods”. She ran the coffee farm there until her return to Denmark in 1931 after some tragic events on the farm and in her personal life. Her house was not available when the film was made, so it was mostly shot at her first farm-house, which was renovated for the purpose to look like her beloved Mbogani. However, soon after the film came out, her house became available and was transformed into a museum in 1986. Many of her belongings were acquired back and now form part of the exhibition, together with some other time-typical items and props from the film. The Blixen Museum in the Nairobi suburb of Karen is a now part of the National Museums of Kenya situated only a short drive from the city center. One hot summer day few years ago, I had an opportunity to visit this museum. Walking through the house had a slightly magical feel to it. Clearly it belonged to another era and felt very authentic. With a little bit of imagination, one could hear Karen Blixen humming an old song in her bedroom. Or see her waiting for her beloved friend Finch-Hatton on the verandah and the two of them later on sitting in the library, which houses many of his books, in one of their deep conversations. The film captures the beauty of these mountains and, in another filming location, the beauty of the Indian ocean and the beach where her friend Finch-Hatton owned a piece of land (I’ll save this for a later post). Her friend Finch-Hatton died in an accident with his small plane and was buried by Blixen in these hills. She marked the grave so that it could be spotted from her house. According to the legend, lions come at dusk to guard the grave, gazing toward the Nairobi National Park. Locals say that lions have been seen on these hills as late as in the 1990s. It’s quite a fascinating story. Have a Moment? Go on a Safari! Transiting in Nairobi, Kenya and have a few hours to spare? Don’t like crowded airport lounges? Go on a mini- safari! That’s right. Nairobi is the only capital with its own National Park, 117 sq km of protected area situated only 10 kilometers (about 6 miles) by road from the city center. So if you are on a short visit or even in transit, you can still enjoy a short game drive! Of course this national park is not large or far out in the wilderness, and you don’t feel that you have entered a domain that belongs entirely to the wild, but surprisingly you really don’t see or even sense the city that much. The landscape is hilly, and once you travel on the savannah and start spotting wildlife, your focus shifts completely. You enjoy what you see – and your mind transports you away from the city. We saw giraffes, buffaloes and several groups of lions. We also saw a cheetah running really fast in the high grass. I guess she was in the middle of a chase, moving too fast for us to even snap a picture. The park also houses black rhinos, leopards, zebras, wildebeests and hyenas and many other smaller species. Of all the birds, I was most fascinated by this large Secretary Bird. I had not spotted one before and this one was kind enough to calmly pose for us not far from the trail. This park is connected to other, larger national parks in Kenya in the sense that it has an “orphanage” for the small ones left without parents and also functions as a major sanctuary for breeding black rhinos, an endangered species, for other parks. All in all, I thought this mini-safari was a great experience, definitely worth doing if you visit Nairobi and have limited time available, or even transit through with a few hours to spare. Refreshes you nicely, and beats the airport lounges hands down! I enjoyed peaking in there again…even if virtually, I hope you did too…Have a good weekend – kuwa na wikendi njema!